Elon Musk’s SpaceX completed another successful launch this weekend, delivering the 7,000 kg Telstar 19 Vantage satellite from Cape Canaveral to offer connectivity across the Americas. The launch, which was partially under threat due to adverse weather conditions, took place on Sunday morning with the satellite deployed 32 minutes after lift-off. Following the separation, the Falcon 9 launch vehicle was successfully landed on the ‘Of Course I Still Love You’ drone ship, an autonomous vessel to allow for recovery of rocket assets, which is stationed in the Atlantic Ocean. The satellite will be owned and operated by Canadian satellite communications company Telesat. Operating from Telesat’s prime orbital location of 63 degrees West, 22,250 miles above the earth, the Telstar 19 Vantage satellite has two high throughput payloads, one in Ku-band and the other in Ka-band, serving the South, Central and North American regions. 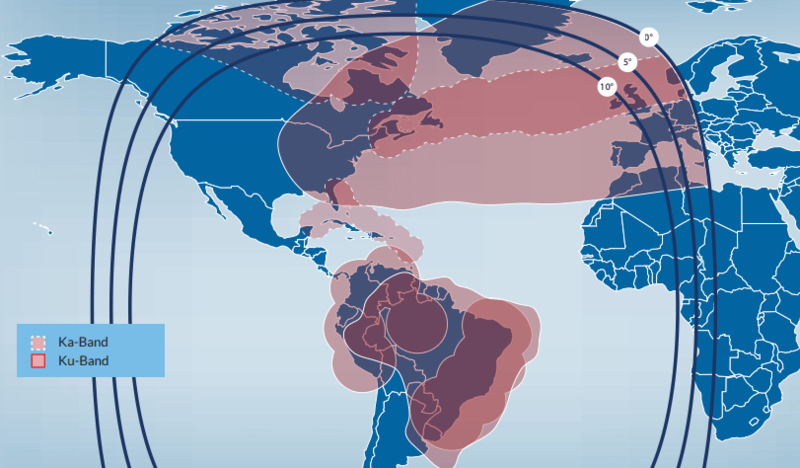 In South America, Telesat’s customer Hughes Network Systems has invested to make use of the Ka-band capacity, while the Ka-band capacity over Northern Canada, the Caribbean and the North Atlantic Ocean will be utilised by several different customers including Bell Canada subsidiary Northwestel. In-orbit testing will now commence before services kick-off in the summer, with a 15-year design life. While the satellite communications segment is certainly a more niche aspect of the overall sector, SpaceX is creating somewhat of a strangle hold on the launch industry with estimates putting Musk’s market share at more than 50%. The trick here seems to be SpaceX’s cash conscious attitude and drive to recycle as much of the assets as possible. While this is the first time this Falcon 9 asset hit the skies, SpaceX has recycled reusable rocket boosters on more than 20 occasions, with the team hoping recovered assets can each be used between 10 and 100 times. SpaceX has a busy schedule over the next couple of months, with the next launches taking place on July 25 and August 2 for Iridium and Telkom Indonesia respectively. It might have been a couple of days overdue, but Elon Musk’s SpaceX has finally launched its first satellite with the promise of delivering high-speed, reliable internet. The launch itself is one of the first steps taken in an ambitious project known as Starlink which will aim to nearly 12,000 satellites to orbit by the mid-2020s to create a space-based Internet communication system. While the idea of satellite delivery for internet is not new, Musk’s plan is to use smaller satellites which operate in a low earth orbit, which in theory should remove any lag in delivery, is a new approach. This lag has been the criticism of such ambitions in years gone. The launch officially took place at 6.17am on February 21, after a three day delay. The PAZ satellite will orbit Earth 15 times per day, covering an area of over 300,000km2 from an altitude of 514km and a velocity of seven km per second. While this might not seem like a huge amount of coverage, once Musk has launched a couple thousand of these assets into orbit, it becomes a much more feasible idea. Now down to the techie stuff. The satellites will employ optical inter-satellite links and advanced phased array beam forming and digital processing technologies in the Ku- and Ka-band according to documents filed with the FCC. Many of the details on how the satellites will actually work are being kept under wraps right now, though we do know the assets will use frequencies above 10,000 GHz. These satellites will be linked to flat user terminals, as opposed to directly to handsets, which can be placed anywhere assuming they can see the sky. In terms of set up, it does sound simple which could appeal to developing markets. It does seem like a very good idea, perhaps one of the reasons it has not been overly considered to date is because of the expense. The theory is there, but the practicalities of running a space-based Internet communication system are relatively unknown – experience for the vast majority has been limited to earth to date. It is an expensive experiment, but Musk has made his name through expensive experiments; blue-sky thinking is generally limited to those with large bank accounts after all. The effect on the wider communications industry is likely to be felt in the rural communities, under-developed market and notorious not-spots though. Musk is unlikely to have any profound impact on the way the majority of Western markets consume the internet, as while this is a nice idea, speeds and reliability from the satellites will not be able to compete with fibre.